Luchadora is one of the best and latest mobile slot game developed by ThunderKick software platform. This game takes place in Mexico where wrestlers will try to get your attention by fighting. This is a 5×4 and 30 paylines mobile video slot and not like a grid based slot game. The highest paying symbols of this slot game are the 4 wrestlers and they known as Luchador in Spain. This slot can be played using any devices such as laptops, PCs, iOS and Android for a starting spin of just 10p to up to €£100 per spin. There are plenty of bonus features available in this slot machine based on Mexico and wrestling theme. You can receive 77 free spins and multipliers while playing Luchadora slot game. The slot offers a jackpot of 2,500 times of your total bet. This slot from ThunderKick is awesome and has beautiful graphics. You will find posters everywhere in the game. The game contains 4 different coloured peppers and 4 wrestlers. The wrestlers are El Serpiente ,El Toro, El Rayo, and El Pantera. The game also features Misterioso Campeón (Mysterious Champion), Smackdown, Lucha and Luchadora symbols. In a casem, where all these 4 wrestlers landing on the 4 corners of the ring and middle symbol i.e. Misterioso Campeón will turn to wild. It means there would be 5 wild symbols on your screen and when it happens you will receive 250 times of your total stake. The first and fifth reels of this slot game are known as Golden Square (in base game) and they are the corner positions and if a wrestler lands on any of these golden square then all wrestlers of with that same colour will transform to wilds and then the golden square will be removed and after a spin the wild will again turn in to wrestler symbol and this is known as Ring Corner feature. In this feature you could get multiple wild symbols. 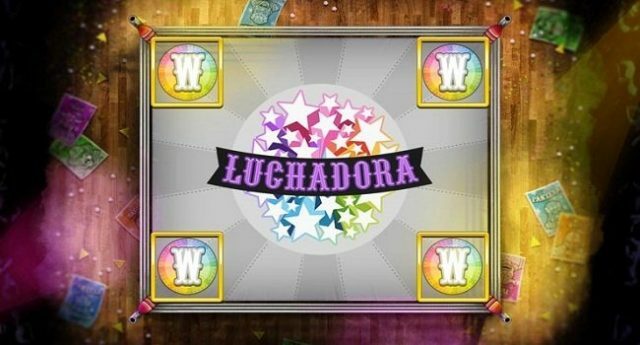 Wilds symbols of this slot can substitute all other symbols except the Lucha Bonus symbol and Lucha Smackdown symbol. The Lucha Bonus symbol is the scater symbol which will give you 7 free spins if you land 3 of these symbols across a payline. The 4 scatters will offer you 11 free spins and 5 scatters will give you 15 free spins. Luchadora is a great slot for every casino/slot player looking to play real money slot games. This is one of the best product of ThunderKick gaming. You should definitely try this beautiful game because it has everything in it.